When you’ve spent time picking out the perfect car or home, you’re more than ready to simply make your purchase. After all, you’ve likely spent weeks, if not months, searching for your dream home or car. So, you probably don’t want to wait any longer. Unfortunately, unless you’ve saved up for the entire purchase or down payment, you’ll also have to search for the perfect loan as well. This is something that also takes time, not every loan is as good as the bullion loans, that’s for sure. Even with the Internet, putting in the effort to find and compare multiple lenders, is not easy or quick task. Luckily, EVEN Financial realized the frustration and lengthy process of finding the right loan and came up with a solution for it. Like with any financial tool, however, how do you know whether or not their services are for you? Well, we did the work for you. Take a look at our review of EVEN Financial to help you decide if it could assist you when finding a loan. 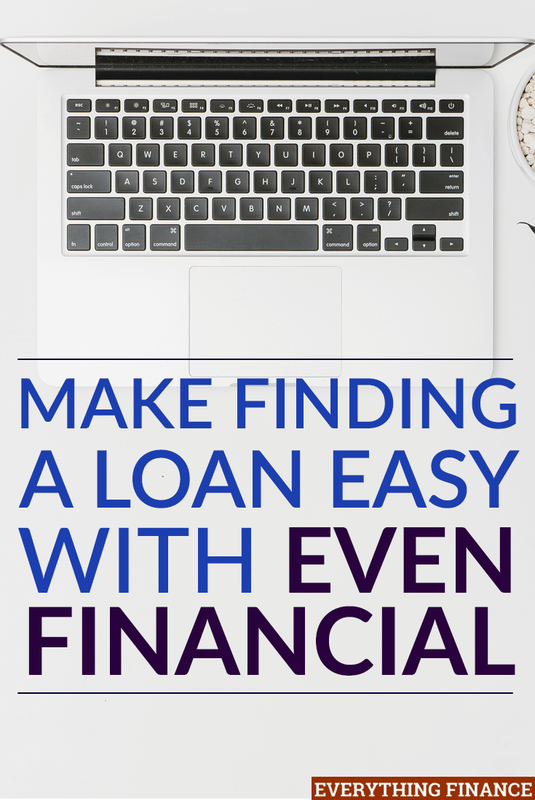 EVEN Financial takes all of the work out of finding the right lender. Instead of filling out multiple applications and applying to an array of financial institutions, EVEN allows you to fill out one, simple application. You’ll receive pre-approval upon qualification, to help match you with the best loan offers available to you. With APRs starting at 4.99%, EVEN can help you find a loan that’s anywhere from $1,000 to $100,000 with a term between 24-84 months. All that’s required of you is to fill out a free application. You will need to know your loan amount, purpose, credit score, and personal and employment information. EVEN promises that you’ll receive offers from top providers within seconds. And you may receive your loan in as little as one business day. Furthermore, there’s no need to worry about whether or not a company specializes in your type of loan. EVEN takes all the guess work out for you and handles all the details. Moreover, EVEN also allows you to consolidate your debt to help you achieve lower rates and can help you plan in advance for major costs coming your way. They partner with a multitude of financial institutions and lenders, such as LendingClub, Ascent, Prosper, and Backed, among many others. So, they can help connect you with the right company to fund your loan. Loans and their rates are offered to you based on your financial situation and credit score. Ergo, the better your credit score, the better rates and offers you’ll receive. But, even if your credit score is less than perfect, EVEN Financial can assist you in getting in touch with institutions and services to put you on the right path to improving your financial score. You can find out your credit score online for free with Credit Sesame! The thought of inputting all your personal information, especially your social security number, into an online financial application can be scary. That being said, EVEN’s application process keeps loan inquiries to a minimum, so that it won’t affect your credit score. And, EVEN Financial utilizes an encryption that keeps your personal information safe. That’s one of the beautiful aspects about EVEN Financial, there is no cost to fill out and submit your loan request. There’s no membership fee, application fee, or service fee. Of course, once you receive a loan, you will have to make monthly payments. Pro: With EVEN’s application 90 percent of the application work is already done for you. Pro: Single, free application that does not affect your credit score. Con: Upon applying you may be flooded with multiple emails if you’re pre-approved. Pro: Quick and easy matching to help you compare available loans. Pro: Can help you find the lowest rates available and instantly receive pre-approval if applicable. Con: EVEN itself is not a direct lender and can only take you part of the way. Pro: You can receive help easily by email, phone, or live chat. Sites like Bankrate provide you with a wealth of information. They provide information about personal loans, credit card debt, financial advice, and reviews of financial institutions and tools. Plus, they give you with the ability to check your credit score, calculate all of your personal loans, investment projections, car payments, and mortgages, and provide you with in-depth reviews of credit cards and lenders. If you’re searching for the best solutions and companies to go with for your loan needs, Bankrate can be a great site to go to. Moreover, they offer advice on every financial topic to help guide you in the right direction with your financial needs. While this is a great resource and tool to utilize if you’re unsure of where to go, it does have one major drawback. You have to do all the work! While Bankrate has taken the time to do the research for you and create the calculators, it’s still time consuming on your part. Not only do you have to read through all of the information before you, but you also have to take the time to apply separately to each lender. And if financial language isn’t your specialty, it can be a little overwhelming to read through and figure it out on your own. Overall, if you’re really looking for a quick and easy route to your loan, EVEN Financial seems to be the way to go. EVEN Financial is honestly useful to anyone looking for a personal loan of up to $100,000. While the offers you receive do depend upon your situation and credit score, EVEN appears to offer helpful service to everyone looking for loan assistance. Again, even if you’re credit score is less than stellar, they can still provide you with help to guide you in the right direction. At no cost to you, EVEN Financial can be a great place to begin when you’re in need of a personal loan. They can assist you in finding the right lender and route to go.